It's cool and cloudy with a chance of rain this Sunday, so a good stew with one of my favorite mashed potato recipes (I have quite a few) is on the menu today. 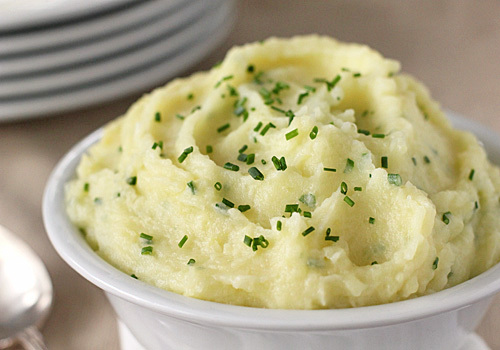 If you are a fan of mashed potatoes, but are looking for a recipe that has a twist to the standard potato-milk-butter version, then I urge you to try this one. 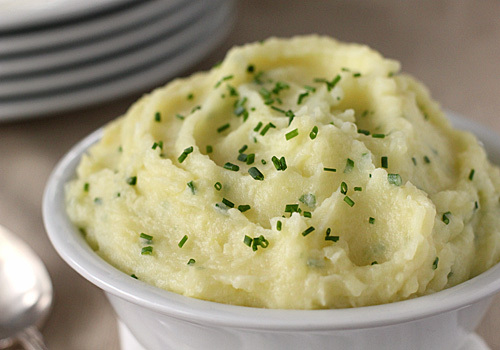 Yukon gold potatoes are used instead of the standard Russet for their buttery taste and texture. Boiled until tender and then riced, they are enriched with butter and crème fraîche to make for a creamy and rich, but not too rich bowl of taters. Chopped chives are stirred in for color and a mild onion taste. Besides the taste, the other wonderful part of this recipe is that it can be made a few hours in advance, making it a welcome addition to holiday menus. Holy jack-o-lanterns are these ever good!! Just look at that slight pull from the caramel layer. 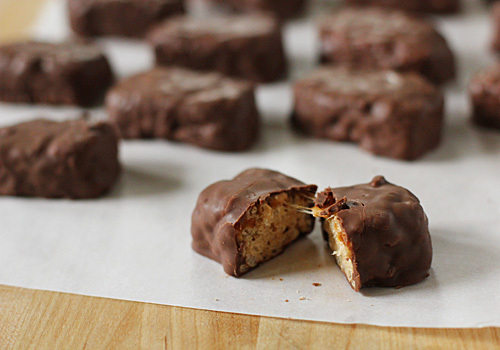 Make these and put the fun back in "fun-size"! Look at the calendar! Just a few days left to milk my Oktoberfest theme! If there were one month to be stuck in for all kinds of reasons, let it be October. Here is the spread from this past Sunday. It is called Obatzda, which sounded more Polish to my husband, but from what I can gather is Bavarian in origin. It is a bier hall staple served with bread, crackers, or pretzels. This delicious spread (dip? condiment?) 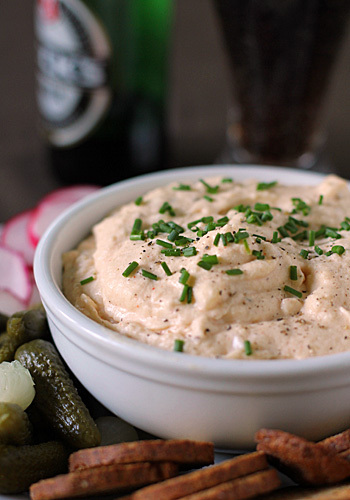 pairs nicely with radishes, pickles, pickled onions, or really anything one might want to accompany deeply flavored cheese yumminess along with a good dark German beer. Although born of bier hall revelry with all of its 44 oz. stein swaying imagery, Obatzda is at home in the home as well. Take Halloween night, for example. Who has time to sit down to a nice meal when the doorbell is ringing every two minutes?! 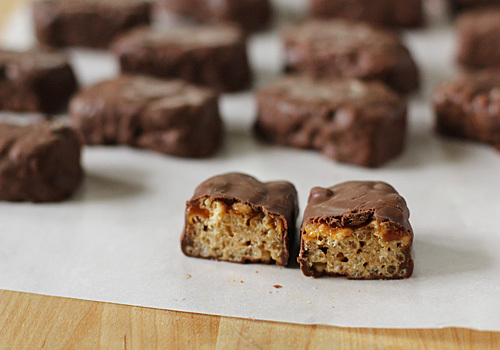 Solution-- set out a bowl with some bread (pretzel bread is a good choice) and veggies and the whole crew can get some wholesome sustenance in between fun-size Whatchamacallits. Hmmm. Those sound good too. This is a picture of every cup of coffee's dream, especially if you are a butterscotch lover like me. If you like a sweet treat for breakfast every now and then (or every now and, like, the day after that) make this cake and enter through the golden door to breakfast bliss. 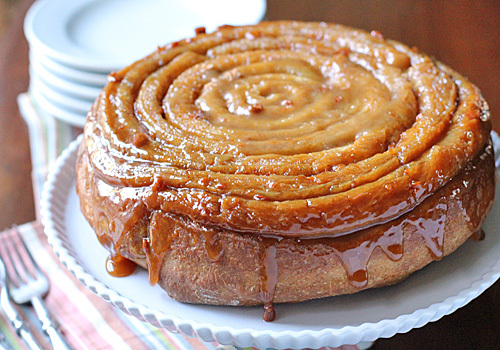 Alec Baldwin's character Blake said in Glengarry Glen Ross---"Coffee's for closers..." This beauty of a cake seals the deal on every level and is a great way to share a giant sticky bun with family and friends. 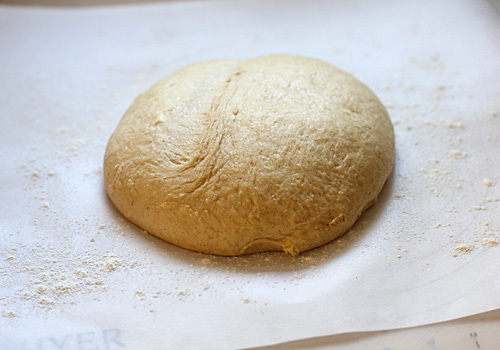 Once the dough has risen and doubled in size, Turn the dough out onto a lightly floured work surface. 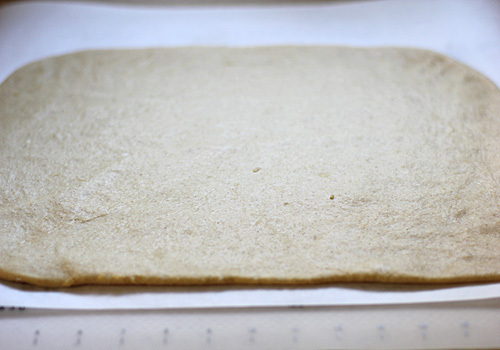 Roll the dough into a 16x12-inch rectangle. 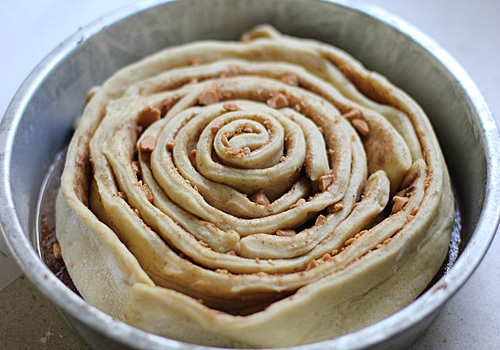 Evenly spread the dough with the cinnamon-butter mixture. 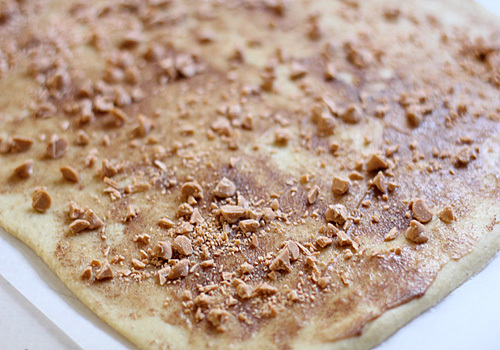 Sprinkle the dough with the butterscotch chips. 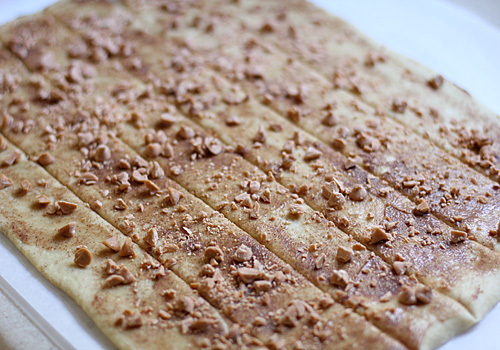 Using a pastry wheel or pizza cutter, cut the dough into six 2-inch side strips. 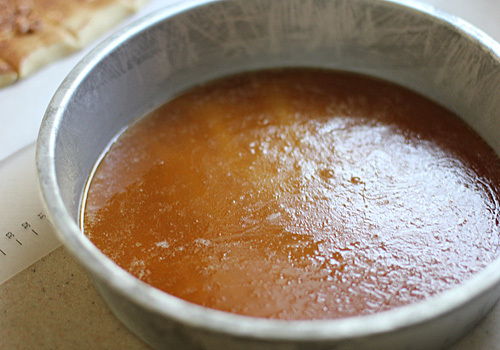 Prepare the butterscotch glaze and pour the it into a prepared pan. 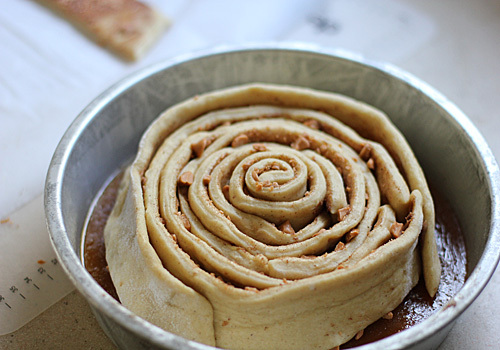 Loosely roll up one strip, cinnamon-butter side facing to the inside, and place it in the pan on top of the glaze. Continue coiling the remaining strips around, starting at the end of the previous strip. The cake will fill in the gaps as it rises for a second time and bakes. 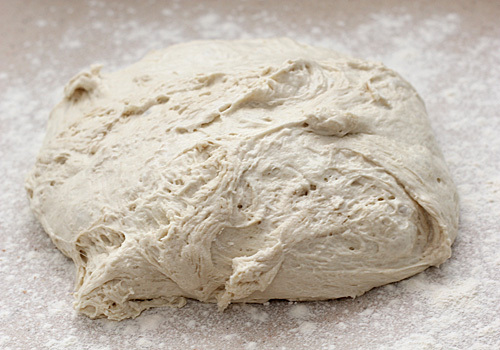 Allow the dough to rise for 30 minutes. Bake in a preheated 350º F until golden brown. Invert onto a serving platter and serve warm or at room temperature. 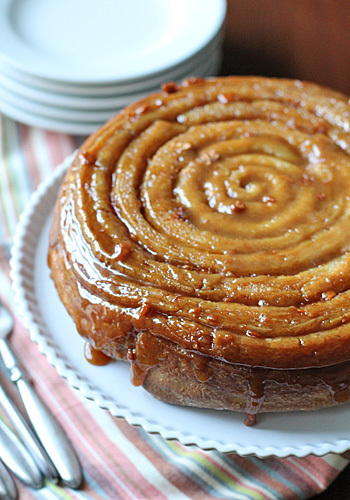 Eat before the spiral swirl pulls you into another dimension...another dimension of flavor, that is! October is flying by and I couldn't let it slip away without an Oktoberfest inspired Sunday dinner. I figured that roast pork and sausages braised in sauerkraut is about as German as it gets. But what to accompany this hearty plate of Fall flavor? Another native of Germany gets a different treatment to fill the bill today. 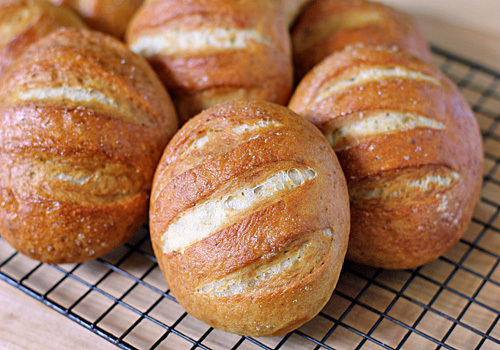 This is basically pretzel dough formed into roll shape. The result is a sturdy, delicious dinner roll with which you can sop up all of the good juices from the pork and sauerkraut. Any leftovers make for a tasty alternative to regular white bread for lunch box sandwiches. As much as I enjoy tarts, cakes, and other baked goodies, sometimes I just need something I can lose my spoon into like pudding, the comfort food of desserts and sweets. Immediately one thinks of chocolate or vanilla pudding (both good choices), but this pudding is a marriage of two of my favorite flavors (next to chocolate, of course), caramel and butterscotch. 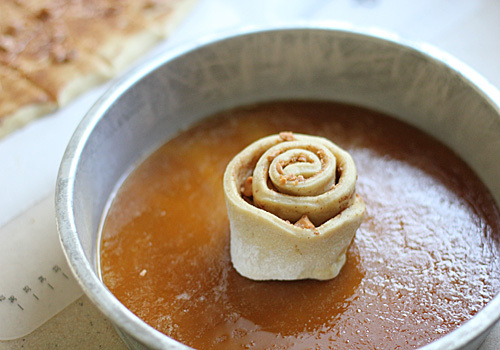 But this isn't just any caramel butterscotch pudding. 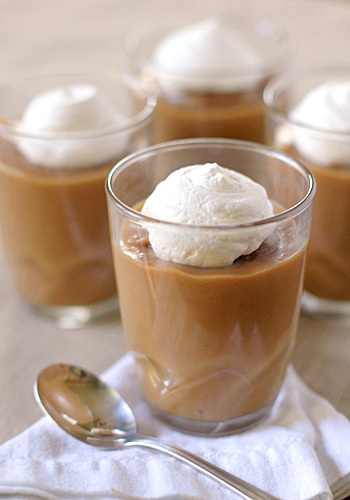 This is caramel butter "Scotch-whisky" pudding. That's right, one small teaspoon of Scotch whisky takes this pudding flavor over the top. Pair the flavor with a sweet, creamy, dreamy texture and...phew! I got the vapors! My guess is that you will too. This is a dressing that appears atop our leafy greens and veggies quite often. Unlike many creamy dressings that call for sour cream and mayonnaise as a base, this one uses cottage cheese and buttermilk. The combination is very creamy with a slight tang. The recipe calls for whole fat cottage cheese and I do not recommend using low fat. The whole fat provides a nice richness that marries well with the other ingredients. On that note, I strongly urge you to use a quality Parmigiano-Reggiano cheese and freshly ground black pepper. 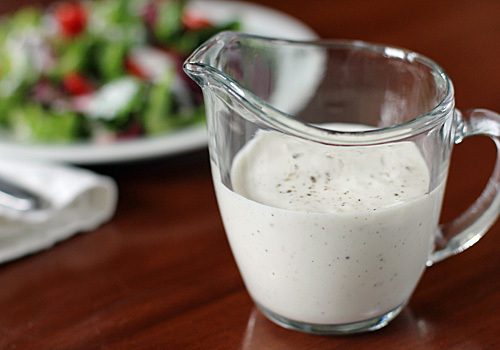 After all, this is a parmesan-peppercorn dressing. 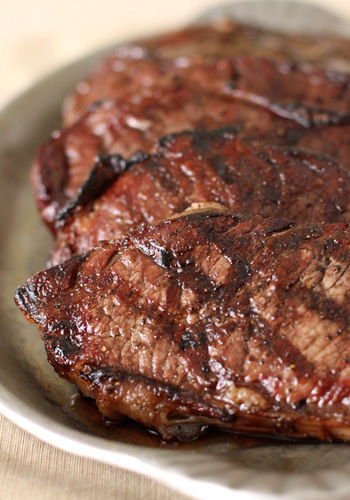 slice open that perfectly cooked, glorious piece of meat. Pavlov could have used this picture for an experiment on humans (o.k those of us that do indulge in meat). It may cause a spike in drool bucket sales. If you are looking for an even deeper beef flavor, I have included a dry aged technique in the recipe below. It is another Sunday birthday dinner and this time it is my turn to plan the menu:) Normally, the birthday boy or girl chooses his or her favorites for the Sunday on or before the actual day, but it just so happens that this meal is composed of not just mine, but all of our favorites from beginning to end. I have already shared the appetizer with you and it is linked to where you can find the original post. 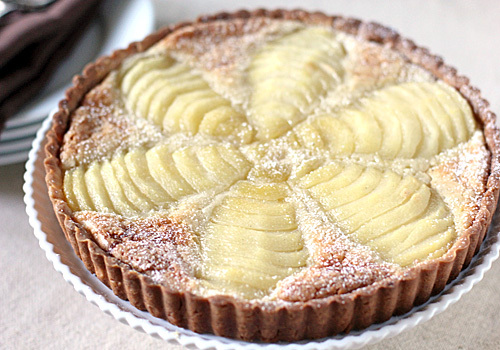 Usually, I would bake a cake for the occasion, but I knew the tart would pair well with the meal. I'll bake the cake for tomorrow since tomorrow is the big day. One birthday and two desserts, that's o.k. by me:) The tart is already made and I know how good it tastes, so this is the recipe I am sharing today. 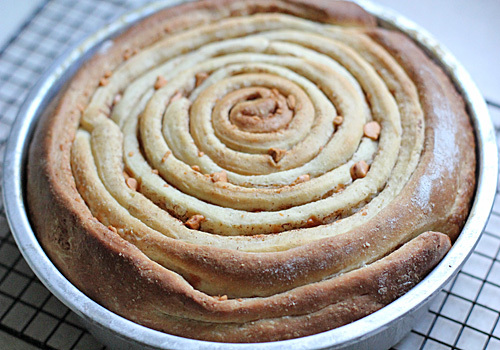 The crust is a sweet tart dough made with some ground almonds; then partially baked. The almond cream is simply almonds, butter, and sugar blended until smooth and spread over the crust. The pears are poached in a spiced white wine mixture until tender, then sliced and fanned over the cream. Baked until browned and puffed-- it is just delightful. The recipe may seem long and daunting, but all components can be made in advance. The tart dough and almond cream can be made up to 2 months in advance if stored in the freezer, so now would be a good time to get started on those holiday desserts. This past Sunday was my youngest daughter's birthday and she requested bagels and salmon for her birthday breakfast treat-- good choice. Since I have already shared my seasonal spiced pumpkin bagel recipe, it's time to share the plain version. Don't let the moniker fool you; these are anything but plain in taste and texture. Many people are intimidated by making bread (or in this case, bagels) from scratch, but really all it takes is a little practice and getting to know the unbaked feel and look of the dough. 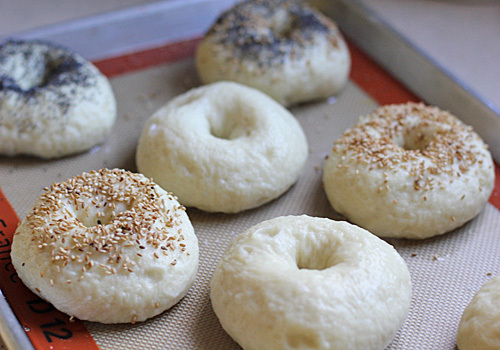 Unlike some bagel recipes that require a sponge, a "float test", and overnight refrigeration (I can see why such a recipe would be intimidating), this one is hands down easy peasy for homemade bagels in under 2 hours-- really. I have included a few step-by-steps to help you along visually. 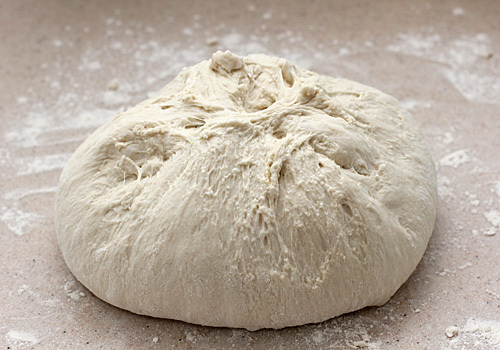 Once the dough has been kneaded and allowed to rise, turn it out onto a lightly floured work surface. Gently de-gas the dough and allow to rest for 10 minutes. 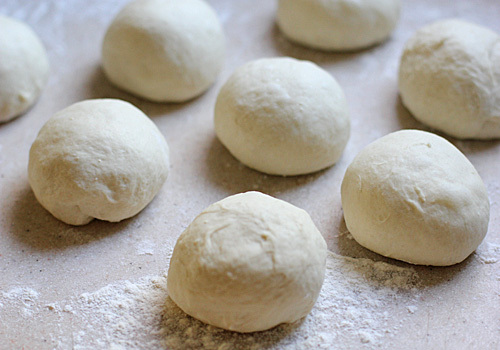 Divide the dough equally into 8 pieces (about 3 1/4-ounces each). Roll each piece into a ball. 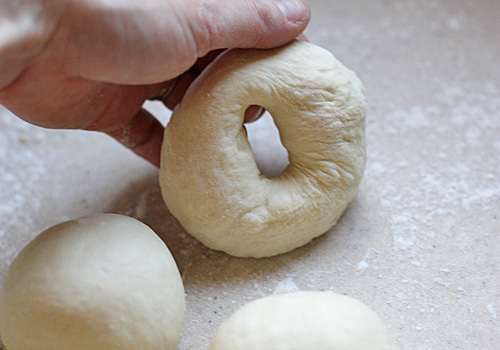 Using a floured finger, poke a hole through each ball and gently stretch the opening about 1/3 of the bagel's diameter. 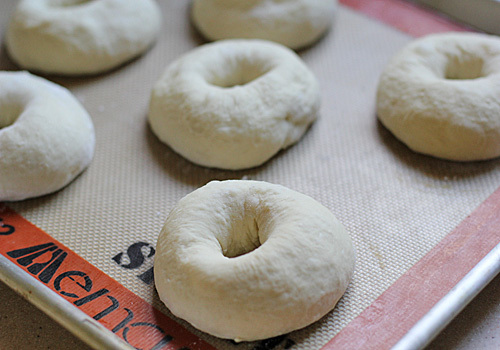 Place the shaped bagels on a baking sheet lined with parchment paper, or in this case, a silpat; cover and let them rise for another 10 minutes. 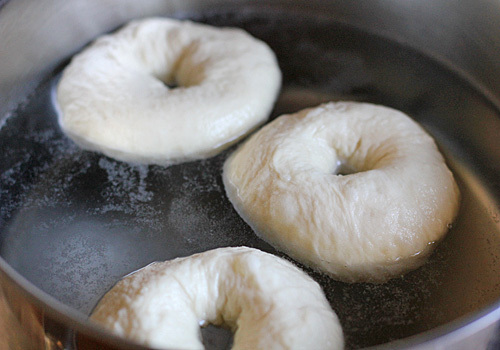 Poach the bagels in a large pot of water for 1 minute on each side. 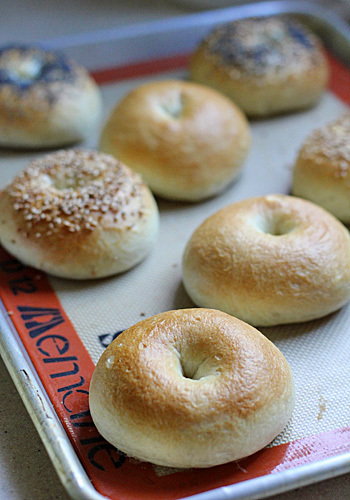 Remove the bagels from the water; drain and return to the baking sheet. Optional toppings, like poppy seeds and sesame seeds are added at this time. Bake in a 425º F oven for 20-25 minutes or until golden brown. 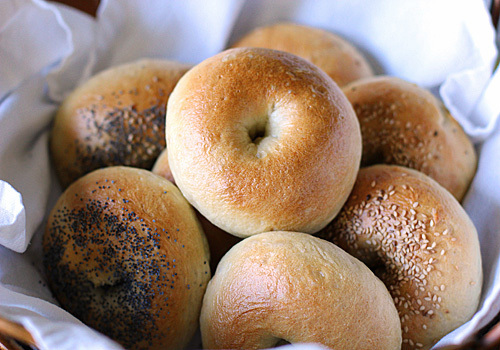 We enjoy them plain, with poppy seeds or sesame seeds, and some with both. They have a perfect light texture and a good pull. The only hard part about these bagels is trying to decide what you are going to top or sandwich them with. Will it be cream cheese, butter-n-jam, peanut butter, Nutella (oh yeah), cheese, eggs, salmon...?! I wish I could give you all a bite of this before you saw it. This is one of those meals where taste trumps appearance. In fact, besides the bits of cilantro on top, it is probably hard to tell what's in there. So, let's dive on in and dish. 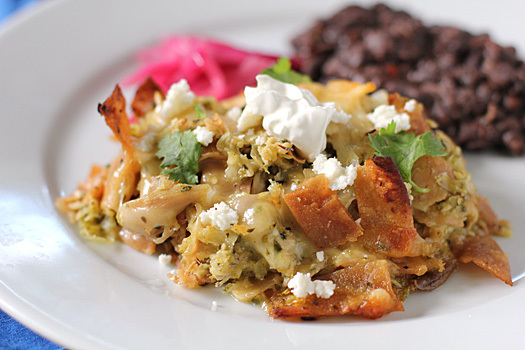 Thrown together to use up ingredients, like leftover meats and day-old tortillas, chilaquiles is a traditional Mexican peasant dish. Unlike some meals where the meat reigns supreme, it is the tortillas that are the star of the show. They are cut into strips and fried until crisp. The original recipe called for shredded, cooked turkey and it is tasty (and a great way to use up leftover holiday birds), but I always have leftover chicken on hand. Both the tortillas and chicken are tossed with a roasted tomatillo salsa into which I add some poblano peppers and lime juice to kick up the flavor . 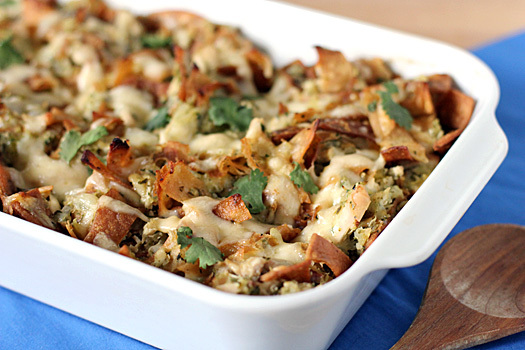 A generous portion of cheese is thrown into the mix and then it is baked until golden brown. Each bite is a symphony of texture ranging from soft and chewy on the bottom, crisp and crunchy on the top, and gooey cheesy all in between. Served with a dollop of Mexican crema or sour cream, crumbled queso fresco, a garnish of chopped cilantro and a spoonful of the remaining salsa-- this is dish I hope you all get to know and love. Although best made the day it is served, it can be made a day ahead. Cool completely, cover and refrigerate; reheat when ready to serve. 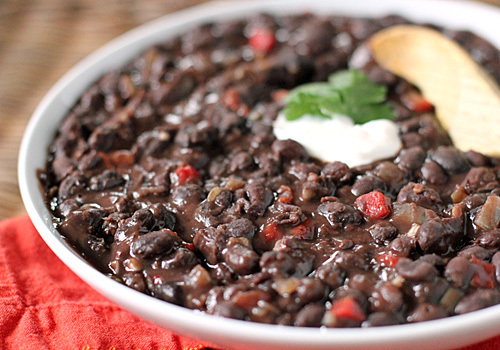 We enjoy it with Quick Stewed Black Beans and Pickled Red Onions on the side. 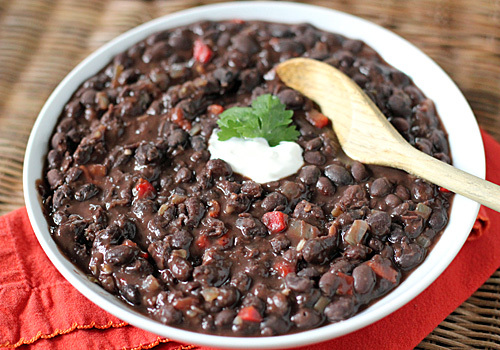 I love black beans that have been stewed for hours at a time as a side to roasts and rice. Alas, during the week, my schedule usually doesn't allow me the time to do this dish the way I want to. Wanting those deep black bean flavors on a busy weeknight, I needed to create a recipe that gives me that with little prep and cooking time. This recipe comes to the rescue. I use a combination of canned black beans and canned black refried beans. That gives you the creamy texture of low and slow cooking. I add onion, garlic, and roasted red bell pepper for flavor and bit of color. Some chipotle chiles in adobe are added for a smoky kick (optional, but good). The whole dish is then thinned with some stock to give it more "stewed on the stove all day" texture. It is a perfect side to roast pork, chicken, and dishes with south of the border accents, like tacos and fajitas. This is a Sunday for celebration. My youngest is turning one year old for the seventh time today. (Since she is my youngest, she is not allowed to grow up:) This is her menu. She absolutely adores pears, so the appetizer is the recipe I am sharing today. I made these a few Sundays back and they went down with rave reviews, so they are on the menu again just for her. The original recipe called for baking the pancetta as crisps, but I thought the "cups" would make for an easier pick up/delivery system, as well as making for a nice presentation. I mix the goat cheese with just a touch of half-and-half so I can pipe it nicely into the cups. 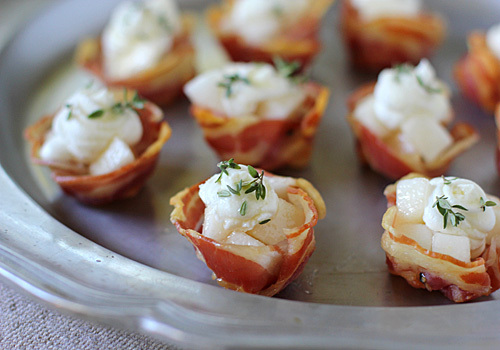 Flavored with fresh thyme leaves and drizzled with good honey to balance the salt from the pancetta, these would make a wonderful hors d'oeuvre to pass or as an addition to any holiday table. If you follow me on Facebook, then you will know that last week I was trying out a new cookie that had bacon in it. Well, here it is in all its morning flavor glory. 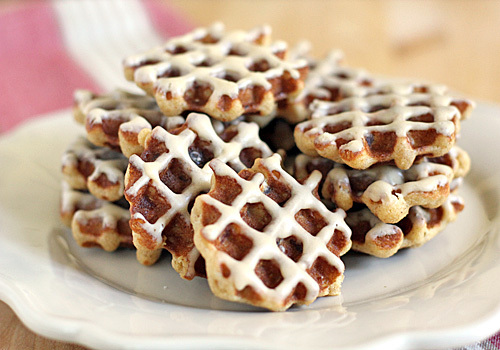 Take some favorite breakfast ingredients like oatmeal, maple syrup, brown sugar, cinnamon, espresso, and yes-- bacon, and cook them in a waffle iron. Yeah, these are a breakfast lover's dream. The bacon is diced and cooked until brown and crisp. The drippings are poured over the oats to soak up all that good bacon essence. 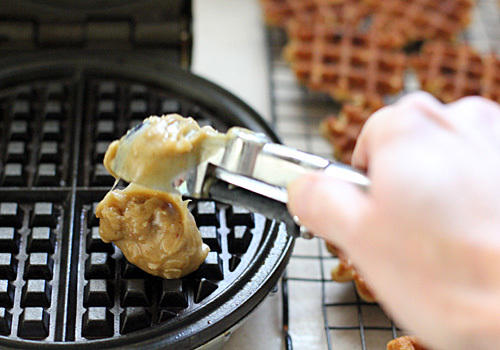 It is then mixed with all the other ingredients including the cooked bacon:) Now comes the fun part-- cook tablespoons of batter into the sections of a waffle iron until golden. The original recipe suggested dipping them in white or semisweet chocolate, but with all those breakfast flavors, I knew an espresso icing would take these beauties over the top-- and it does! They are best enjoyed the day they are made, but they will keep for another day. Zap them in the microwave for about 2 seconds to bring out the warm breakfast flavors without melting the icing and you are good to go. In fact, these are a portable dessert breakfast on the go. 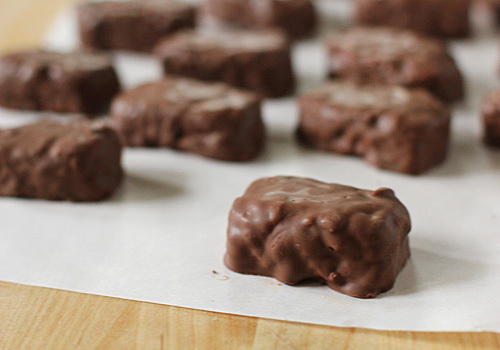 We enjoyed these ourselves and shared a few with neighbors, but I would suggest surprising brunch guests with these on the buffet or whip up a batch for a kids' slumber party. They will surely be a hit! 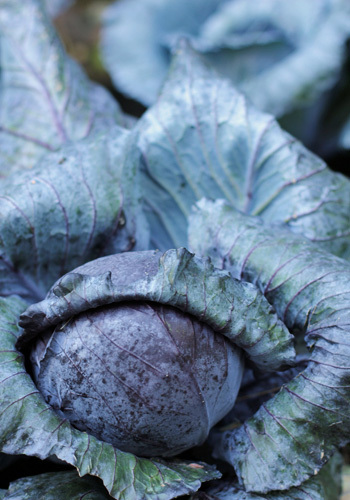 I have some red cabbage ready in the garden and as much as I would like to enjoy some braised red cabbage, the weather has been unseasonably warm. So, this salad found its way onto the menu this week. 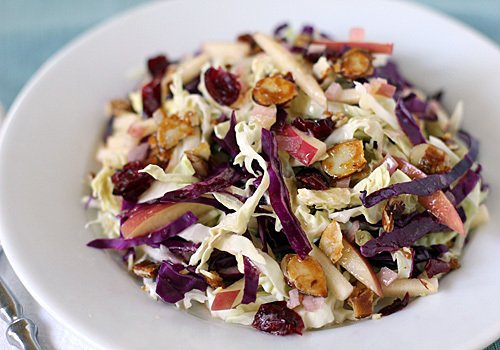 It is a cool salad with the flavors of Fall, like cabbage, apples, dried cranberries, and almonds. I make a simple vinaigrette with red wine vinegar, a little Dijon, some minced shallots for a mild onion addition, and-- almond oil. I love using nut oils in vinaigrettes when the salad itself has nuts in it. Yes, nut oils are more expensive than a standard salad oil, but the nutty flavor is really enhanced when used. (Once opened, store the nut oil in the refrigerator to keep it from going rancid). Not only are there layers of sweet and savory flavors, but there are textures as well. The cabbage and apples are crisp, the almonds crunchy, and the dried cranberries add a sweet chewiness. Sometimes, I add some crumbled mild goat cheese or a bit of gorgonzola for even more flavor and an added creamy texture. Served as a side to pan-fried chicken or pork, a sandwich, or even by itself for a light and meatless lunch (as pictured above), this is a delightful seasonal salad. I have an over abundance of apples in my kitchen right now and I am certainly not complaining. 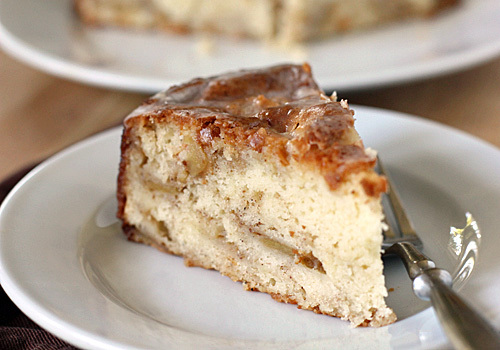 Most of them are enjoyed simply out of hand, but some are reserved for the good stuff, like applesauce, apple butter, apple galette, and this coffee cake. The cake batter is made with cream cheese, making for an incredibly moist cake. You can certainly use full fat, but I use reduced fat to lighten things up. It is a "spiced" cake, so instead of the orange juice or apple juice, I use apple cider, partly because I always have it on hand this time of year. There is a bit of cinnamon, but the real flavor comes from the cardamom. 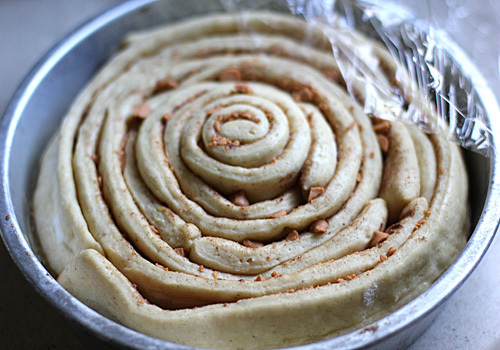 If you have never baked with cardamom, I highly urge you to try it. It is intensely aromatic with sweet and spicy notes. While still warm, the cake is covered in a simple vanilla glaze. The coffee cake can be enjoyed at room temperature, but it is particularly nice slightly warm. It is perfect for breakfast with a cup of coffee, brunch with family and friends, or a sweet pick-me-up for an after school snack. 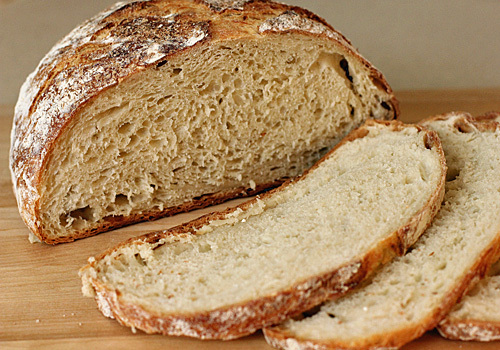 If you are a regular reader, you might recall seeing this bread on our menu many times. Today I am finally sharing the recipe. This recipe is from a New York Times article that created quite a buzz several years back. 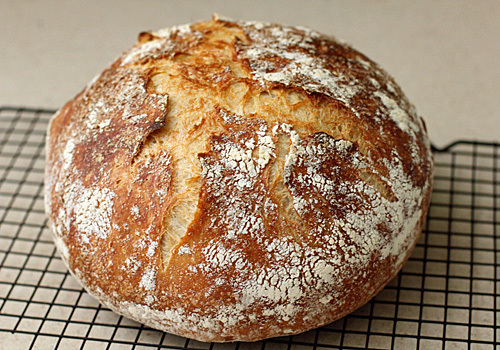 It is the from the renowned bread baker, Jim Lahey of Sullivan Street Bakery in New York City. He eventually came out with his book, My Bread, with all his bread baking secrets. I tried the original as is and it was really good, but the one thing missing for me was the size. I wanted a big rustic loaf. One that not only I could use for the dinner table but for the rest of our weekday meals. So, I doubled the amount of ingredients and added a bit more salt. 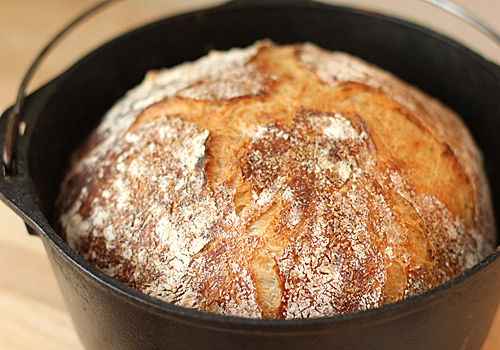 Baked in a 5-quart seasoned cast iron dutch oven, this loaf of bread is a thing of beauty. It is 10-inches wide, about 4 1/2-5 inches tall at it's highest point, and weighs between 2 1/2 to 2 3/4 pounds (that's today's weight). This is a simple bread to make; no kneading required, but it does take some advance prep and time. 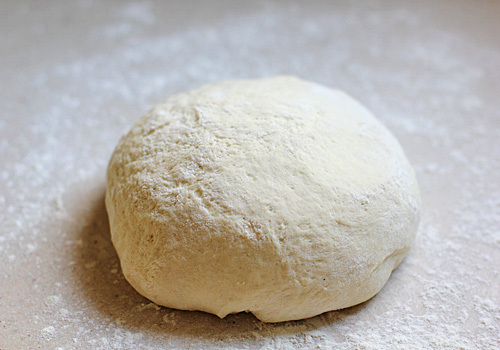 Below I have included a few step by steps to help you with your bread dough skills. 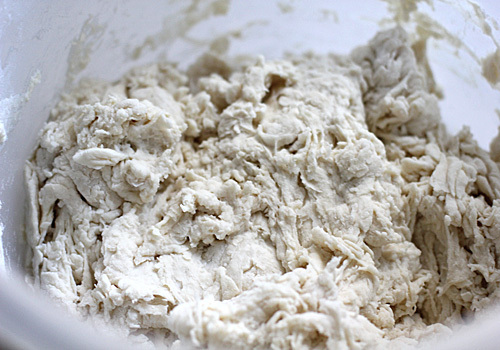 First, mix the flour, salt, yeast, and water in a large bowl or gallon container until wet and sticky; flour should be completely incorporated. If not, add a tablespoon or two of water. Cover lightly with a towel, plastic wrap or a loose fitting lid and allow to rest in a warm, draft free spot to ferment, about 12 and up to 18 hours. This long fermentation is the key to great flavor. 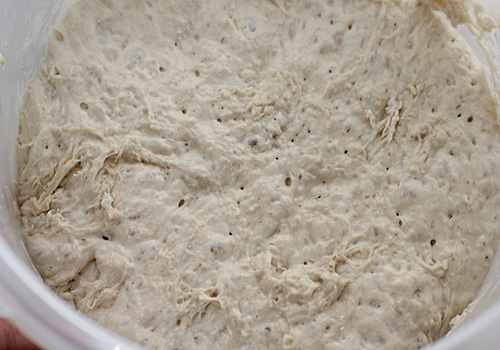 After the first rise, the dough should have doubled in size and bubbles should appear on the surface. Generously dust a work surface with flour. 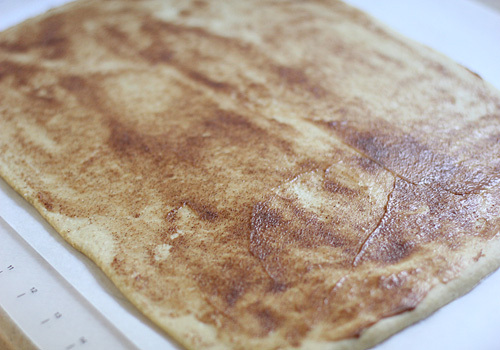 Turn the dough out onto the floured surface in one sticky piece. 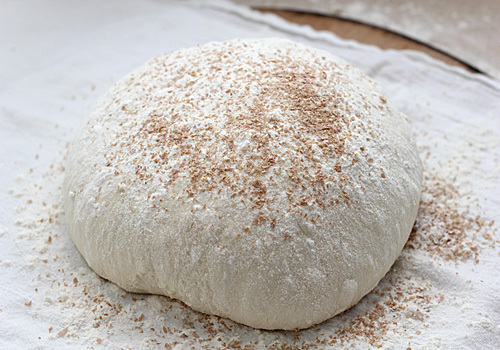 Using floured hands or a bowl scraper, gently lift the edges of the dough and fold in toward the center working around the entire dough. Pinch the top of the dough to hold in place. 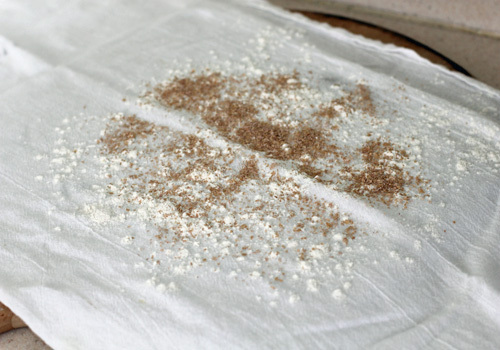 Generously dust a thin cotton tea towel or linen cloth with flour and wheat bran. 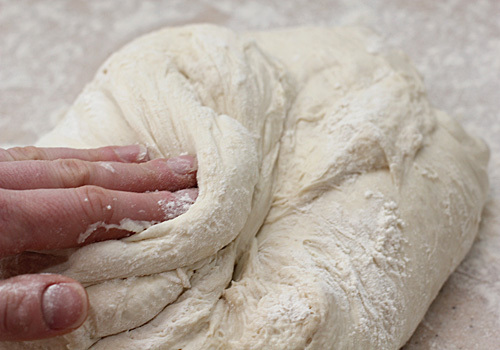 Place the dough seam side down on to the prepared towel. Sprinkle the top of the dough with more flour and wheat bran. 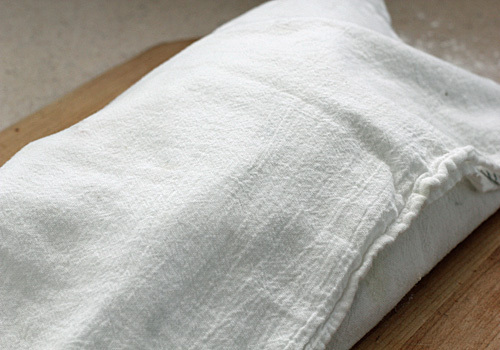 Lightly cover with the sides of the towel and say, "nighty-night" for another hour or two. 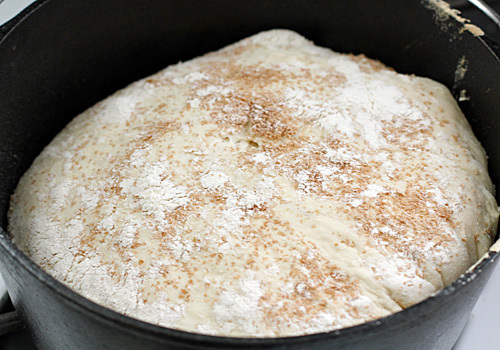 Preheat the oven and heavy pot or dutch oven with a lid in a 475º F oven. Carefully invert the dough into the hot pot, cover, and bake for 25 minutes. Remove the lid and bake until deep golden brown. Carefully remove the hot bread to a baking rack to cool. But don't leave the kitchen. Wait a few moments and listen carefully. The bread will begin to-- sing?! That's right, as the hard crust contracts and cools, it sings! Nothing like being serenaded by your food:) Allow the bread to cool completely before slicing. Once cool, slice and enjoy warm for dinner, a slice toasted for breakfast, and anything in between. Just look at all of those nooks and crannies just waiting to be slathered with butter or drizzled with olive oil--mmm!